Snapchat announced that its audience grew to 173 million daily users in Q2. That’s a nice improvement from the 143 million users it had one year ago, but it was 2 million users shy of the level Wall Street expected. Snapchat’s stronghold continues to be in North America, as we can see in this chart from Statista. 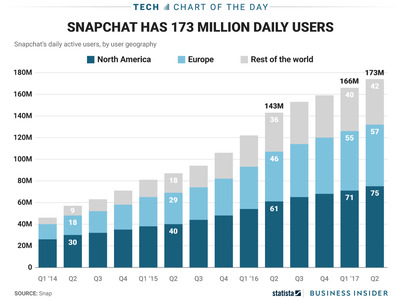 While Europe is also a big market for Snapchat, the company is not adding users as quickly in that region. Snapchat’s growth in the rest of the world continues to lag, perhaps owing to the longrunning challenges it has had with the version of its app for Android — the more popular smartphone operating system outside the US. During Snap’s Q2 conference call on Thursday, CEO Evan Spiegel said the company had made improvements with its Android app, but that certain issues required more significant structural changes that could drag into 2018.